Ljubljana has nice pubs, where you can get special specimens of beers, like Patrick’s pub Patrick’s Pub, Sir William’s Pub and others. But what was missing until recently was an expert beer shop, where a beer lover (like me) can get exactly what he wants, from whatever country he wants. 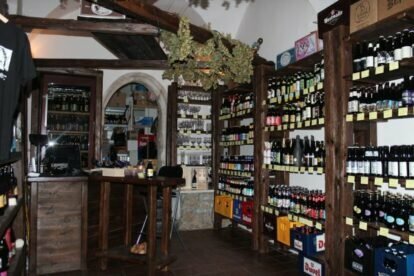 The shop is located in the very core of the city, between Stari trg and Mestni trg in the back of an atrium in an old house and one can pass by without even noticing it. That would be a mistake! When entering into a small lobby you are presented with a shelf wall, where different “families” from all over the world wait for you to pick them up. “Oh my god”, I thought the first time: “I’m in heaven.” Lagers, Pale Ales, Wild Ales, Stouts, Porters, Ambers, (black) I.P.A-s, Trappists, Lambics, fruit beers, from Belgium, Germany, USA and many other countries. There are just too many of them to choose from at once, so my suggestion is to try some from Human Fish, Bevog, Pelicon, Reservoir Dog, few of the most popular Slovenian craft breweries in recent years. There’s actually nothing better than buying and trying some in the shade of Ljubljana’s finest summer beach Trnovski pristan and enjoying its’ pre/mid/post-taste and value the hard work of the Slovenian micro/craft-brewers.